Tired of salads that are only a little more than a bowl of lettuce? Bored of the same old bagged salad kit? 1. Make it lean with greens. 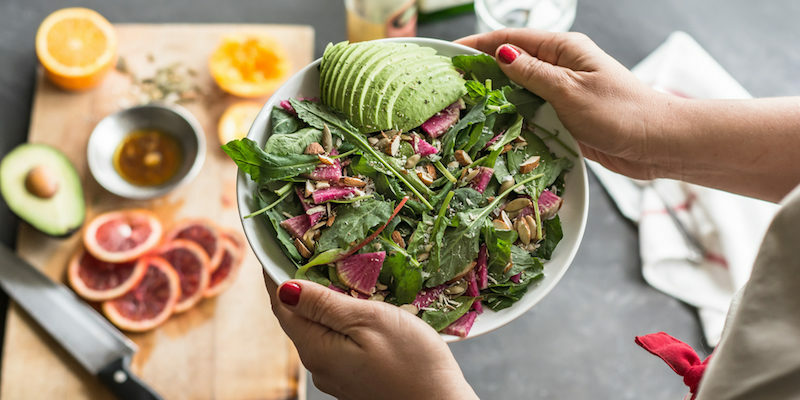 Start with a base of fresh, leafy greens like kale, spinach, leaf lettuce, romaine, arugula, frise and radicchio to help you meet the daily minimum of three servings of vegetables per day. Two cups of mixed greens provides your daily requirement of Vitamins A, C and K and a powerful dose of disease-fighting phytonutrients. Boost fiber and nutrition with another cup of fresh, steamed or grilled colorful veggies. Some of my favorites include grape tomatoes, grilled eggplant, beets, summer squash, asparagus, broccoli, Brussels sprouts and red peppers. Next, add 3 to 5 ounces of calorie-conscious lean protein, like grilled chicken, tuna, eggs, salmon, tofu, shrimp, lean beef or cottage cheese. Protein foods bring flavor and texture, but they’ll also help you feel full for longer. A report published in the Journal Of The Academy Of Nutrition And Dieteticsanalyzed data from 20 studies and foundthat eating protein-rich meals kept peoplefeeling fuller longer, compared to lower protein meals with the same number of calories. If you’re struggling to lose or maintain your weight, eating protein-rich salads and reducing low-quality calories that don’t contribute to satiety may help. Aim for about20 to 30 grams of protein for your salad.Forgo or limit calorie- and saturated fat-rich proteins like bacon, salami and other processed red meats and full-fat cheese. For more interest, a few tablespoons of slivered almonds, toasted pine nuts, walnuts or seeds (think pumpkin, sesame, sunflower or flaxseeds) add crunch along with heart healthy fats. One of my favorite salads with crunch is this beet and goat cheese salad with walnuts. Looking for something more exotic? Try pomegranate arils or crispy onions. Use caution with croutons because a half-cup serving of some store-bought seasoned varieties can add over 100 calories. 4. Drizzle it with dressing. While olive oil and vinegar is an easy, basic dressing, it will make your salad will go from “ho-hum” to “yum” if you get more creative. For a burst of flavor that perfectly compliments greens and grains, add a mix of cumin, honey and curry powder to a base of canola oil and balsamic vinegar. It’s a perfect finish for this black bean, mango and quinoa salad. You’ll have a tasty dressing in minutes that’s high in heart-smart monounsaturated fats, thanks to the canola oil. I love canola oil for all my dressings because it’s a neutral flavor, and the light texture doesn’t overpower other ingredients. For a rich, creamy option that won’t wreck your waistline, try this amazing Green Goddess dressing with a fat-free Greek yogurt base. Hearty whole grains like bulgur, quinoa, brown rice and kasha offerdelicious nuttyflavor and important nutrients like fiber, B vitamins and high quality carbohydrates. Many are good sources of protein as well (take note, vegetarians).Research indicates that eating whole grains in placeof refined grains lowers the risk of many chronic diseases. While benefits are most pronounced for those consuming at least three servings daily, some studies show reduced risks from as little as one serving daily. For something different that will wow your tastebuds, try this Chinese black rice, orange and avocado salad. If you want to take it a step further, a few extra touches can transform a salad from ordinary to extraordinary. Add fresh, shopped herbs like cilantro, mint, basil, lemongrass or parsley. This Middle Eastern-style Fattoush salad infuses mint and cilantro for a rich and flavorful meal. For a little sweetness, consider fresh fruit like apples, pears, berries, peaches or citrus. This mixed greens and apple saladis one of my favorites. This article was originally published on WebMD.